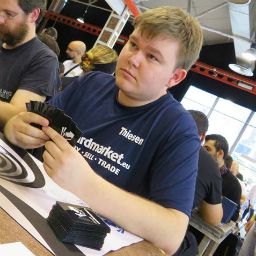 We'll start things of with Tomas Mar, who won the MKMS Frankfurt 2018 Legacy main event with his beloved Czech Pile list, also known as 4c Control. The goal of this deck is to play efficient 2-for-1s across 4 colors until you have significant card advantage over your opponent; victory will soon follow. You play as a blue midrange deck that focuses more on the control-ey side of Legacy midrange. This is the fairest of the fair – we’re playing Night’s Whisper after all. The game-plan for this deck is straightforward: Step 1) Get ahead on cards, Step 2) …, and Step 3) Profit. This means that once you are familiar your deck's card advantage engine, you will be well prepared to take this deck far. Some knowledge about your opponent's cards will help inform your decisions, but much of this can be picked up without too much practice before-hand. It is also a Legacy deck that plays close to “normal Magic.” Deathrite Shaman is your most important creature, and this is the deck that will use its mana-producing ability the most. It really salvages your somewhat fragile manabase against Wasteland decks. Be aware that this deck is not comfortable with changing gears to become the beatdown deck. It is, however, necessary sometimes. One example of this is against Lands, where they can outgrind you with ease using recurring Wastelands and Punishing Fires. What this deck wants to do is make Marit Lage as quickly as possible and then let the giant kraken win the game quite easily from there. Wasteland is quite annoying which explains he main decks Pithing Needles, Karakas is another thing to name. Crop Rotation for Sejiri Steppe can act as protection against Swords to Plowshares and other colored spot removal or bounce. Sylvan Safekeeper makes any surplus land act as a free counter spell, since you mostly care about things that can kill Marit Lage. Legacy specialists who know the ins and outs of Brainstorming will likely find this deck a little linear for their tastes, but if this is your first Legacy event, then this deck can wreak havoc with very little practice. If you’re not used to Legacy, however, you might consider replacing your Cabal Therapies with Thoughtseizes as getting the name right can be a challenge without more Legacy experience. A normal game consists of you using discard to either slow your opponent down or remove their disruption before eventually making a 20/20, preferably with one or two pieces of protection if you’re playing against a white deck. Otherwise, the protection is rarely needed. Be aware that sometimes you want to combo on your own turn, to play around Wasteland and sometimes, you want to do it at the end of their turn, to play around Lilliana of the Veil and Jace, the Mind Sculptor. This GP was Team Trios Constructed meaning that one player was playing Legacy, one player was playing Modern, and one player was playing Standard. But, we're here for Legacy, so let's check the best Legacy lists out. Jonathan has been enjoying a lot of success with Sneak & Show and might be the single-most experienced player at using the archetype. However, this deck doesn’t require endless practice for success. It is an A+B Combo deck where you want to assemble a “big dumb thing” and a “way to cheat the big dumb thing into play,” Then you stare straight at your opponent and ask, “Do you have Force of Will?” If they do – then you probably have your own to counter theirs and you proceed to win the game. Otherwise, they just lose the game once the Spaghettiest of all Spaghetti Monsters devours their board and life total. This is a very clean and streamlined deck. You want to get ahead on the board and then use cheap removal and disruption to stay ahead. Wasteland make sure your Dazes will stay live during a longer game. This deck is a well-oiled machine that can eke out narrow wins against everyone while it still has some amount of free wins where you just “Delver people” with a quick threat and some disruption making sure your opponent is never in the game. If you’ve never played legacy before I would not recommend this deck. Even though it plays somewhat close to normal magic, there are still a bunch of narrow edges you can miss if you’re not experienced with the deck. This might be the perfect deck for someone who occasionally dabbles in legacy, but hasn’t specialized themselves in a certain archetype. It can beat anything, but it can also lose to anything. This deck also exists in different versions, some rely more on stifle and drop the Therapies, some drop the Spell Pierce for more Therapies. Note that Gitaxian Probe can act as a “Build your own better Thoughtseize” with Cabal Therapy. As a final note, it is useful to remember that not only is Legacy a format of format specialists, there are also many deck specialists. No matter what score I gave a deck here, if your legacy seat favors a certain strategy, either because they have experience with it or it just suits them better, let them play that strategy. Familiarity with a deck adds a lot of points. I hope you found this quick run-down interesting and look forward to next time where I’ll introduce my own favorite deck which is what I, personally, would play in the Legacy seat of a team event.